Last night I participated in an online training event for transformation coaches with Sean Smith at Motivating the Masses. It was a really good session for coaches like myself. I’ve also read awesome things about Sean Smith in the past so it was a great opportunity to experience him teach for myself and to learn from him directly. He gave a lot great information in the two hour session, but he also said something that I do not agree with. It is something I have heard many times before and every time I hear it I still disagree. He said that as a coach, speaker, trainer, etc., you have to talk about what people want to hear and teach what they want to learn. The idea is that people are more receptive and open to listening if you are saying what they want to hear. They are more likely to work with you and buy from you if you are teaching what they want to learn. 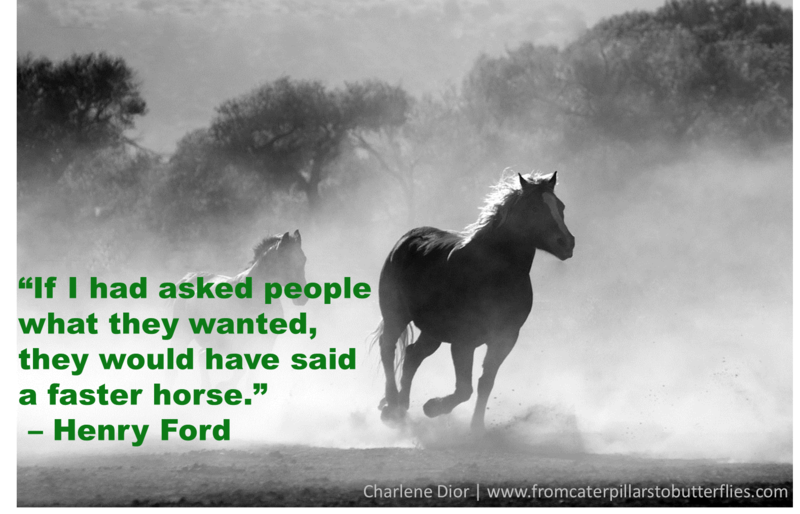 Henry Ford said that if he would have asked people what they wanted they would have said faster horses. I definitely think there is a balance between meeting people’s immediate wants and holding the vision for them when they can’t see it for themselves. As a coach, I hold the vision. My goal isn’t to deliver faster horses, at least not in the long run. My goal is deliver cars. There are plenty of things that people need to hear but they do not want to hear. They are simply too afraid to hear. They prefer not to hear because then they can use the excuse that they didn’t know and no one ever told them. At times they don’t even realize that there is something else worth listening to. I am leaving my mark on this world. My Favorite Quotes from Life Coach Tony Gaskins, Jr. Previous story Why Is It So Hard to Transform Your Life?